Happy Earth Day everyone! Just noticed the animated Google-logo for today, very cute. But of more relevance to us are the plans to Green-Up for the London Olympics next year. However, and sadly, they have had to downgrade their plans to produce 20% of their energy from renewable sources to just 9%. This BBC report says that's down to a lack of a main wind turbine. Still, it is a lot more positive than you might have expected from such a massive event. Two more reports from the organisers to come, it will be interesting to see what practical eco-measures they will put in place for the athletes and spectators. And as an aside; I smiled at the caption the BBC have on a photo of the 1948 London games: "Environmental concerns were not an issue for the 1948 Games' organisers." Any excuse to get in how often London has hosted the games I guess. What eco-measures have you seen at large sporting events? That's great to see that massive events try to be environmentally conscious. 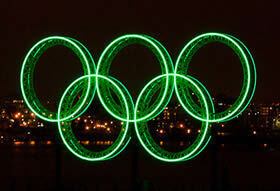 I remember when the Olympics were held in Sydney which aimed to be environmentally friendly. Apparently, the Olympic Village was one of the largest solar powered suburbs, they used recycled water for irrigation and toilets, and a lot of the material used was recycled during the building stages. @ runner's life - Really? That sounds great, and I suppose there is no shortage of solar energy in Aus but still great they made the effort. And 11 years ago that wouldn't have been so common. Hope it works out for London too.